First unveiled to the public at the 2008 Beijing Auto Show, the Mercedes-Benz GLK-Class became an instant staple in the luxury crossover SUV segment. Aside from the luxury appointments that are expected under the Mercedes-Benz brand name, the GLK has exceptional towing capability, power, and practicality. With an athletic design, the GLK inspires adventure without sacrificing the luxury and comfort desired in everyday driving excursions. Despite the luxury appearance of the 2015 GLK, the compact crossover has enough power and heart to perform both on and off the road. With a starting MSRP of only $37,900, the GLK is an affordable option for drivers who desire the Mercedes-Benz brand name, without breaking the bank. Two trim level options are available, each with a different powertrain, standard amenities, and capabilities. The 2015 Mercedes-Benz GLK-Class offers an affordable option for drivers who seek luxury appointments of an executive-sedan, and the practicality of an SUV. Available packages offer unique additions to the GLK-Class SUV, at nearly every budget. One of the most alluring aspects of the 2015 Mercedes-Benz GLK-Class, is its price. Starting under $40,000, the GLK-Class delivers much more than meets the eye. Designed to be responsive on nearly every driving surface, the GLK is both ready to climb mountains, and conquer the concrete jungle. The design of the 2015 GLK-Class is purposeful in every line, curve, and cut. The elegantly muscular exterior, contributes to the rugged performance that rests underneath its hood. Standard 19-inch wheels, a rear spoiler, and a dual chrome exhaust, further expose the performance-oriented design of the GLK-Class. ts, and dark privacy glass all come standard to help complete the exterior look of the 2015 GLK-Class. The interior design of the cabin features standard amenities such as a 3-spoke multifunction steering wheel, Burl Walnut wood trim, a 4.5-inch color instrument cluster display, Bluetooth audio, and an HD radio receiver. No matter how far off the beaten path your GLK-Class takes you, your comfort and ability to connect is never compromised. The power underneath the hood of the 2015 Mercedes-Benz GLK-Class is just as impressive as the interior and exterior of the compact SUV. Both engine options boast impressive horsepower and torque, and have an overall towing capacity of up to 3,500 pounds. Drivers can opt for a clean-burning diesel engine, or a standard gasoline engine. The 4Matic all-wheel drive system comes standard on the high-end trim level, and optional on the base GLK-Class. Other advanced technology such as Agility Control, Direct Injection, and Start/Stop technology, is incorporated under the hood of the GLK-Class to deliver the most efficient and exciting ride possible. Mercedes offers drivers two options when it comes to the 2015 GLK-Class. Each of these trim levels features the quality and reliability of all Mercedes-Benz vehicles, at a great price. Discover each of the trim levels below, and what they offer. GLK350 SUV - Starting at just $37,900, this base trim level boasts power, performance, luxury, and capability. Power and Performance: A 3.5-liter gasoline powered V8 engine comes with the base trim level. This Direct Injection engine is complemented by a 7-speed automatic transmission, shift paddles, and an Agility Control suspension. This GLK-Class model makes 302 horsepower, and 273 lb.-ft. of torque. This impressive power can tow up to 3,500 pounds with ease. Comfort and Convenience: The GLK350 is loaded with plenty of features to make driving across town, or across the country, comfortable and fun. Standard interior features include a dual-zone automatic climate control, a 14-way power driver seat with 4-way power lumbar support, a retractable luggage cover, and an advanced infrared-remote window opening and closing feature. Audio and Entertainment: The 6-speaker audio system that comes standard can utilize the included USB audio port, HD Radio receiver, and Bluetooth audio streaming, for music on the go. A 5.8-inch full-color display makes controlling these systems simple and convenient. Interior Design: The GLK350 features a richly appointed cabin with chrome accents, Burl Walnut wood trim, privacy glass, and a 4.5-inch color instrument cluster display. Safety: Safety is a priority that all drivers have, and the GLK350 covers all of its bases. Featuring advanced safety features such as rain sensing windshield wipers, adaptive braking technology, NECK-PRO front head restraints, and night security illumination, the GLK350 is ready for just about anything. GLK250 BlueTEC SUV - Starting slightly above the base GLK350, this high-end GLK-Class SUV has a starting MSRP of $39,400. This model features a clean-burning diesel engine, that is the main differentiating factor from the base model. The 2.1-liter BlueTEC turbodiesel 4-cylinder engine is paired with a 7-speed automatic transmission for ultimate performance and efficiency. With 4MATIC all-wheel drive, an agility control suspension, and shift paddles, this diesel-powered GLK-Class hits the nail on the head when it comes to power. With 200 horsepower, the GLK250 BlueTEC can tow up to 3,500 pounds. 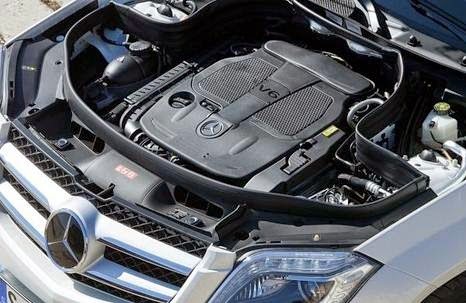 Both models of the 2015 GLK-Class come standard with the same amenities and included features, but very different engine blocks. Choosing one comes down to simply figuring out which is the better fit for your lifestyle. Whether you crave more technology, power, safety, interior luxury, or convenience, the 2015 Mercedes GLK-Class has a package for that. A leather package adds premium leather upholstery throughout the cabin for less than $2,000 - while the interior ambient lighting package adds premium interior lighting for right around $300. Plenty of advanced safety technology can be added, including the Surround View System, PARKTRONIC with Active Park Assist, Blind Spot Assist, and Lane Keeping Assist. Drivers who seek an overall enhanced appearance can choose to add aluminum roof rails and larger alloy wheels. A comprehensive Multimedia Package can be built into the GLK-Class for under $3,000, and includes everything you need for the ultimate technology-based drive. The Premium Package offered on the 2015 GLK-Class SUV has the most expensive price tag, but boasts the most additional features. For $3,450, the Premium Package will add elements such as a panorama roof, power liftgate, garage door opener, integrated compass, a Media Interface, and much more. Whether you decide to stay with the base GLK-Class SUV offerings, or add your own premium flare - one thing remains the same: the 2015 Mercedes-Benz GLK-Class SUV is the best vehicle choice in its segment for all around performance, safety, convenience, and technology.